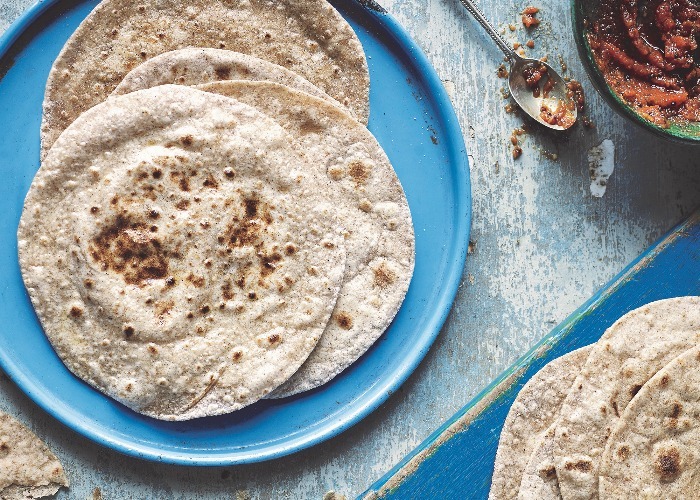 This basic chapatti recipe is a healthy one – there is no added salt, oil or any other ingredient. Just flour and water gives you perfect, simple chapatti that taste amazing. Use them to scoop up sabjis, curries, chutneys and pickles, and as wraps. This recipe makes 12 chapatti. Put the flour into a bowl. Very slowly, mix in just enough of the measured water to bring the mixture together in a dough – you might not need all the water or you may need a little more, so add just a few drops at a time. This is the best way to achieve a dough that is the correct consistency: smooth but not sticky. Once the dough has come together, knead it on a clean surface for 2 minutes. Leave it to rest, either in a covered bowl or an airtight box, for 15–20 minutes. Divide the dough into 12 equal portions. Roll each portion into a ball in your hands, then roll each ball in a little flour to dust. Using a rolling pin, roll out each ball into a circle with a diameter of 15–18cm (6–7 inches). Heat a skillet over medium heat until hot. Carefully transfer 1 rolled-out portion of dough to the hot skillet and cook it for a few seconds on the first side, then turn. Allow the chapatti to bubble up a little on the second side, which will only take a few seconds, then turn it over again and cook for a few seconds, until it is golden and cooked through. Pressing gently on the edges with some kitchen paper or a clean tea towel will encourage the flatbread to puff up a little. Transfer the chapatti to a serving plate and spread a tiny amount of ghee across the top surface. Keep the chapatti warm while you repeat the process with the remaining portions of dough. Wrap them in foil or in a clean tea towel until ready to eat. Serve the chapatti hot.